Many people are captivated by the elegance and character of historic homes, only to buy one and discover the functions of a modern lifestyle don’t mix with earlier architecture. The modern, active family we worked with on this project was having difficulty making life work within the confines of the existing rooms and the many out buildings. We redesigned both interior and exterior areas to provide the living space they wanted without sacrificing the beauty of the home. 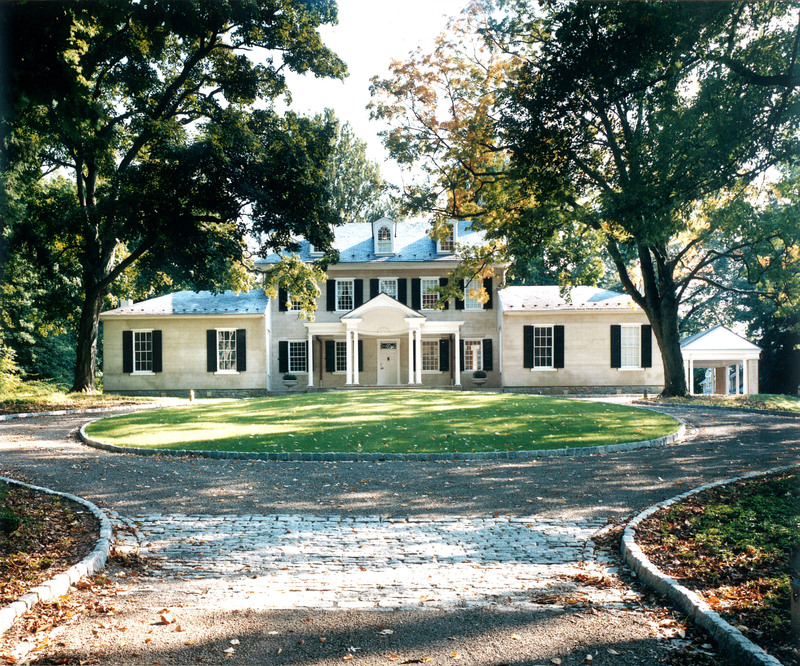 The formal entrance is a striking focal point of the exterior. We did a total exterior rehabilitation that included a new slate roof, repair of windows, shutters, and moldings, and new paint. The pediment style gable with a clamshell vault is a new element added to emphasize the entrance. The grandeur of the home is now showcased with the new circular driveway leading to the entrance. Outdoor living can now be enjoyed at this gracious and spacious pool area that includes a covered dining pergola, an HAA designed pool deck, a pool house conversion of an old garden shed, and an outdoor grill area. 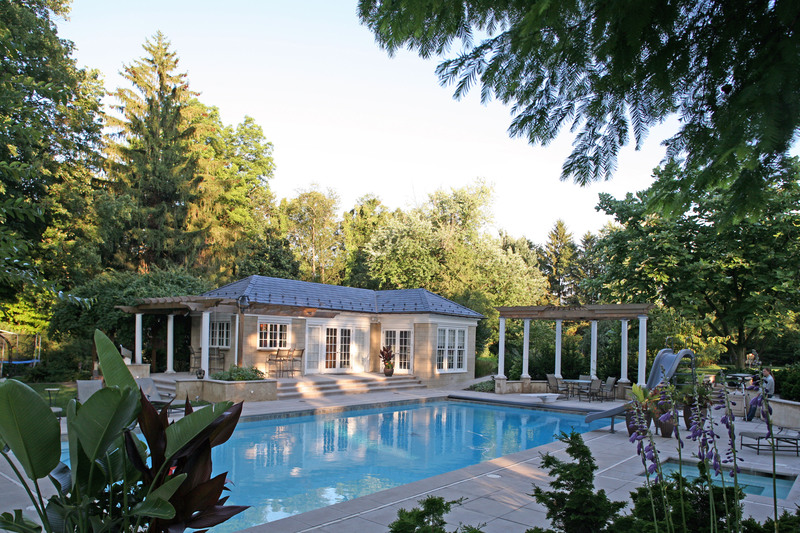 The limestone pool deck, stairs, and patios match the exterior materials of the main house. This is a popular entertaining area for both adult and kid functions, as well as a fun backyard escape for the family. 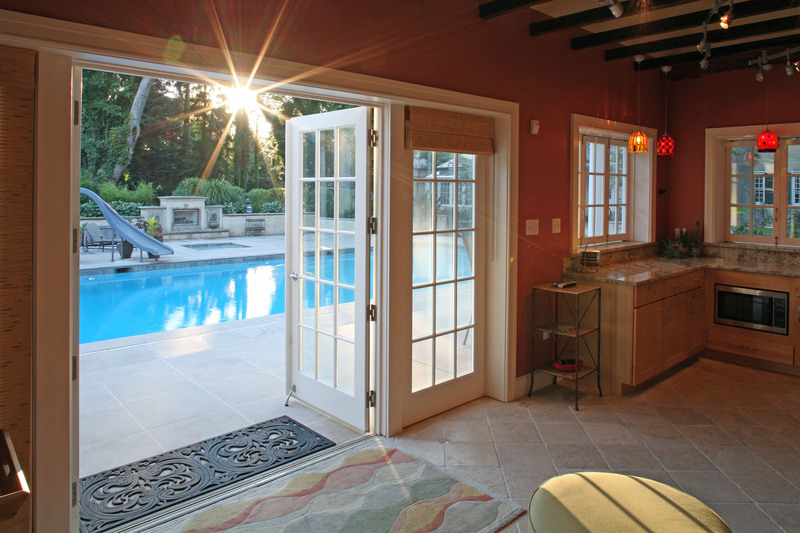 The view from the pool house shows the outdoor fireplace behind the hot tub, both of which extend the use of the outdoor area into cooler months. Inside the pool house is a complete food prep and serving area. Windows open so the sills extend as stool-height serving counters outside. Warm wall colors, richly toned ceiling joists, and fun, colorful pendant lighting make this an inviting, fun alternative to the more formal house. 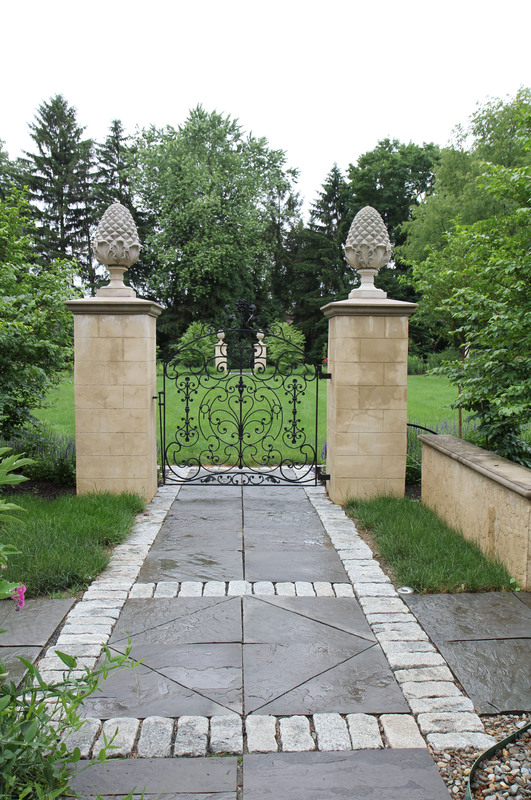 Near the pool house is a formal garden, accessed through this beautiful entrance. Cut slate pavers are accented with Belgian stone borders. 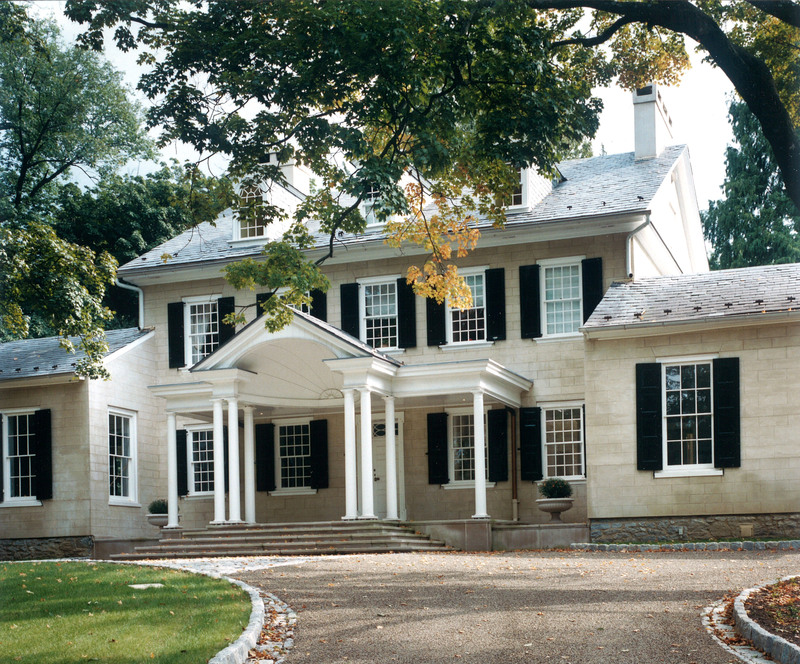 The stucco garden wall and posts, with limestone trim and finials match the home’s exterior. Finials have a pineapple motif, the symbol for hospitality. The ornate metal entry gate reflects the grandeur of the home without obstructing the view of the landscape and the distant set of matching posts. A woodland outdoor living area is located in a more secluded part of the yard, further away from the pool and main house. 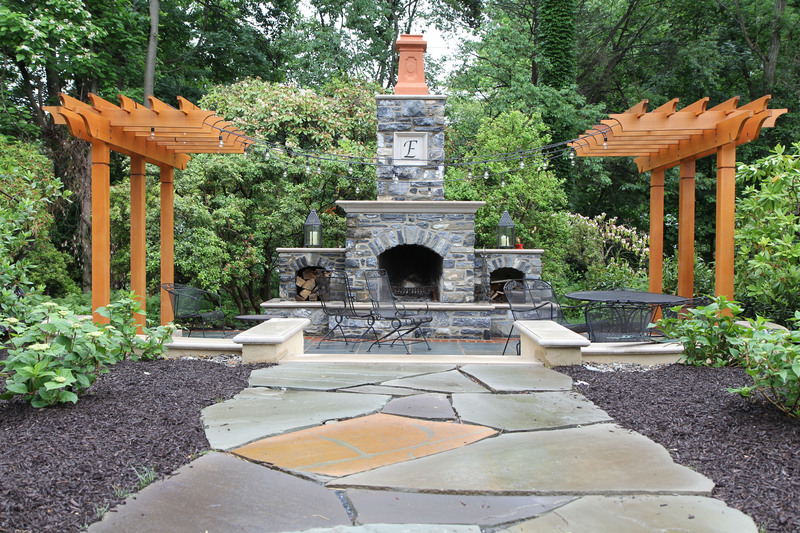 The massive stone fireplace provides warmth in cooler seasons, while the surrounding trees provide shade and cooling during summer months, making this a multi-season retreat. The trellises, limestone, and pavers reintroduce the elements of the home in this natural setting, where subtle lighting makes the area accessible at night.